Is that so cool when enjoying videos on the new ‘handle media player’ iPhone 6? With the bigger screen size, it is awesome to look them as little TVs, right? In order to presume higher Video quality for nice enjoyment, H.265/HEVC videos have attracted our eyesight. 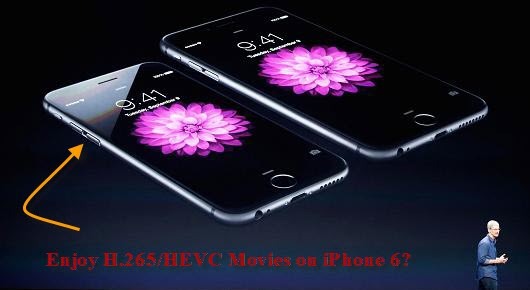 So in this article, we are going to introduce you the HEVC encoder/decoder for iPhone 6 and make it easier to watch H.265 movies on iPhone 6. H.265 /HEVC is coming to our daily life! With the use of H.265 (High Efficiency Video Coding HEVC) for FaceTime over Cellular by Apple’s iPhone 6 and 6 Plus, many of us may figure out if H.265 comes to FaceTime, will it be far behind for H.265 comes to Mac OS X (Yosemite), QuickTime, iTunes, iPad, iPod, Apple TV? H.265 will surely become the mainstream video codec and format for Apple, or even other mobile device, and Windows. Compared with the H.264, H.265 can offer us higher quality and smaller size. 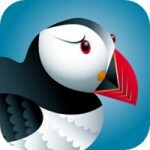 That’s the main cause why it is popular among our Apple fans. 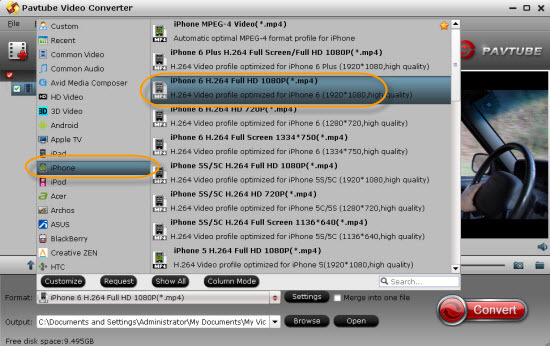 H.265 Encoder/Decoder for iPhone 6: Pavtube Video Converter for Windows, which has the upgraded version 4.8.2.0 specially designed for H.265/HEVCcodec. To meet the H.265 encoding and decoding needs, this video converter can work with the H.265 so well, of course for watching on iPhone 6. 1.Act as the H.265 Encoder: this Pavtube H.265 Converter is aimed to encode all variety of video files including MP4, MOV, AVI, WMV, ASF, MPG, MKV, VOB, FLV, AVCHD, MXF, MOD, TOD, R3D, TS, RMVB, WTV and etc to H.265. 2.Act as the H.265 Decoder: it cal also decode H.265 videos to other various formats, such like MP4, M4V, WMV, MOV, AVI, etc. 3.Act as the H.265 Editor, you can get into the ‘Edit’ to know more. ‘Trim’ to decide your video length, ‘Crop’ to cut the unwanted edges. Some other functional items you must be interested in here. 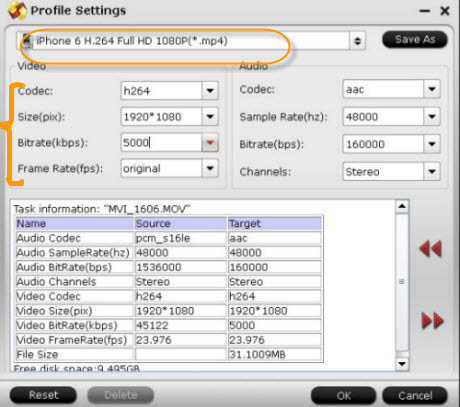 How to convert H.265/HEVC videos to MOV for playback on iPhone 6? Download the H.265 Encoder from the Pavtube official website and install it according to its instructions. When the main interface pops up in front of us, just press on the icon ‘Add video’ on the left corner to load your video clips individually or with ‘Add from folder’, a complete file folder can be added easily. Also, batch conversion is supported well here. Step 2. Select the suitable formats for playback on iPhone 6. From H.265/HEVC to H.264 MP4, we suggest you to drop down the output list and find the ‘iPhone’>>’iPhone 6 H.264 Full HD 1080p(*.mp4)’as the best output here. In order to enjoy a nice enjoyment on iPhone 6, how about set the videos as our favorite? Step into the ‘Settings’ interface, let’s set the video size as 1920*1080, bitrates as 5000 and the frame rate as ‘original’ is okay! For the final step, it is time to go back to the main interface and press on the ‘Convert’ button to start your conversion work. No needs to wait for a long time, with the faster conversion speed, you can quality get your output MP4 movies to watch nicely on iPhone 6. I have been browsing online more than three hours lately, but I never found any attention-grabbing article like yours.It’s lovely price sufficient for me. Pavtube Video Converter is a big solution for H.265 video conversion. Thanks! I am so glad to have found Pavtube’s Video Converter because I can easily get H.265 videos onto my iPhone 6. No other converter works nearly as well as this one.